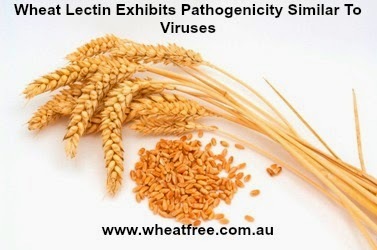 Wheat lectin provides biochemical defense against predation. Wheat lactic is often overlooked while considering wheat’s primary mechanism of toxicity fixing all antigens. It is the primary component of wheat generating properties of 23000+ proteins identified in the wheat proteome. Like most organisms, wheat has evolved its defense mechanism to fight predators. It produces ‘invincible thorn’ wheat lectin to wade of predators. To understand the mechanism may not be compliant with our attempt to make it a primary source of nutrition. WGA (Wheat Germ Agglutinin) lectin and viruses have many interesting similarities between them. WGA lectin are taken into a cell through a process of endocytosis and attaches to the cell membrane. Both WGA lectin are viral particles with several orders of magnitude smaller than the cell they enter. WGA and influenza gain entry through sialic acid coating of our mucus membrane. Each have neuraminidase enzyme for virus and WGA lectin has wider reach in the host body. Once the WGA and influenza virus enters the body, they are both capable of blurring the line in the host. Influenza incorporates itself into the genetic material of the cell and controls the protein production machinery to replicate itself. It enforces our immune system to attack its own transformed cell to disinfect itself. Research done on herpes simplex virus shows that WGA has the capacity to block virus infection by binding to the same cell surface receptor. WGA influences gene expressions of some cells and is associated with autoimmunity like other lectins like soy lectin and some viruses like Epstein-Barr virus. WGA has the capacity to cause certain cells to exhibit class 2 human leukocyte antigens (HLA-II) making them destruct automatically by white blood cells. Human antibodies cross react with other proteins even if WGA doesn’t transform the phenotype of cell to ‘other’ .This results in cross reactivity of WGA to antibodies resulting to autoimmunity. If it would be possible to preload wheat with pathogenic lectins designed to respond to the physiology sensation to eat or not. It would definitely put up a fight. It is not that impossible to consider its effect as a pathogen for our body.